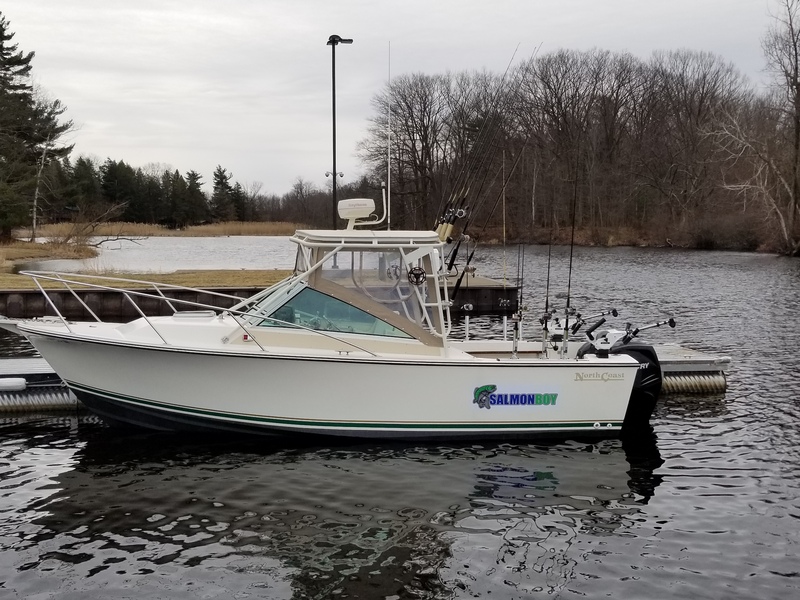 The new boat is in the water and fishing has been nothing short of AMAZING. 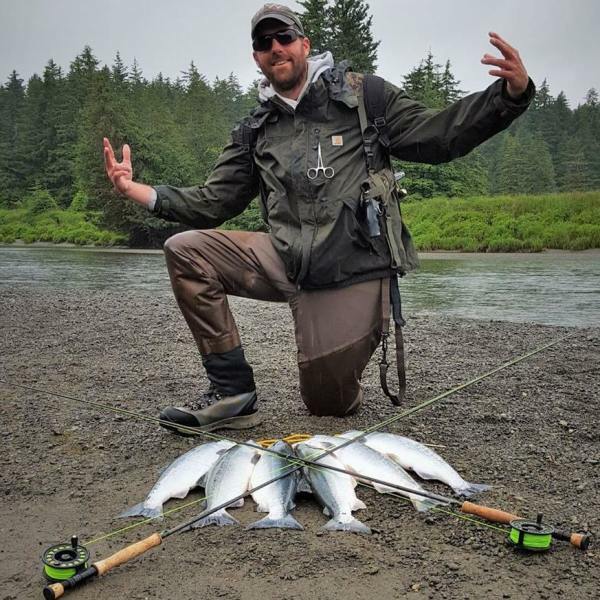 We have been targeting mostly Brown Trout but King salmon are already starting to randomly show up so it won't be long before we go into full King mode. The bite is still strong but it's hard to believe the season will be wrapping up soon. Boat is in Oak Orchard through 8/12 and will be launching out of Mexico afterwards through mid-September. 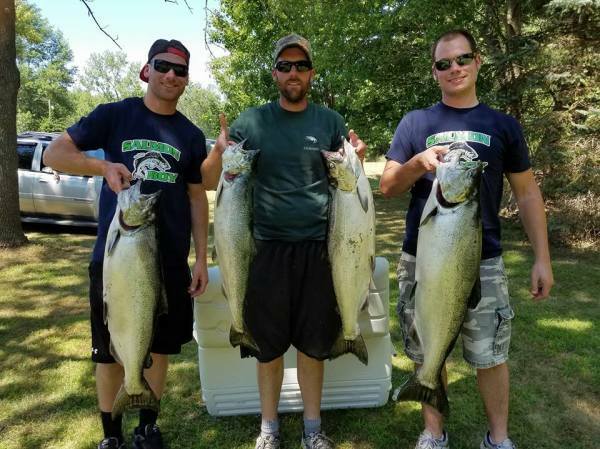 If you're from the East end and you want to go, click "Book Now" below and let's go catch the big ones! 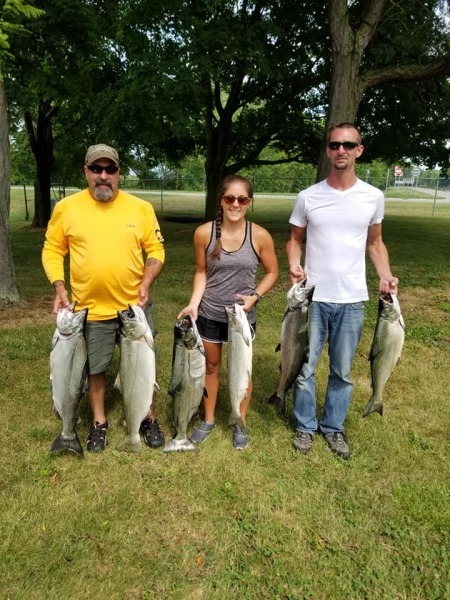 As planned, the boat moved to Oak Orchard in the last two weeks and the weather has been hot but provided some great conditions otherwise. Lots of trips with clientel who "boxed out" and had the luxury of picking which fish to keep! The best catch of the month was definitly baby girl. The next generation of Salmon-slayer is here! Emma Natalie Oakes joined us 8 days late at 8 lbs 11 oz. Still got out fishing and the King bite has stayed strong in the last month. 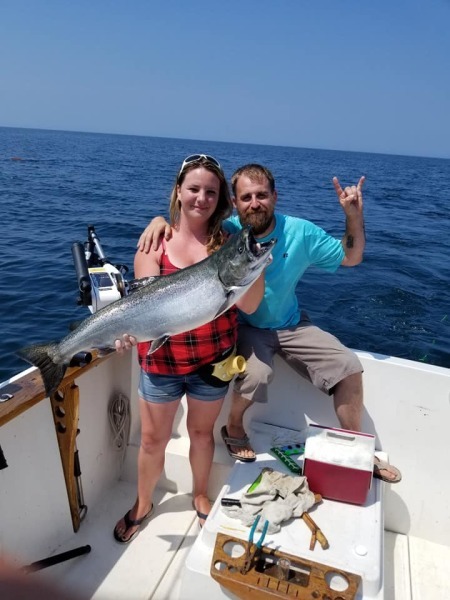 There's still plenty of time to book a trip out of the Western end (Wilson/Olcott) before we start heading East with the fish. Planning to be in Oak Orchard last two weeks of July. 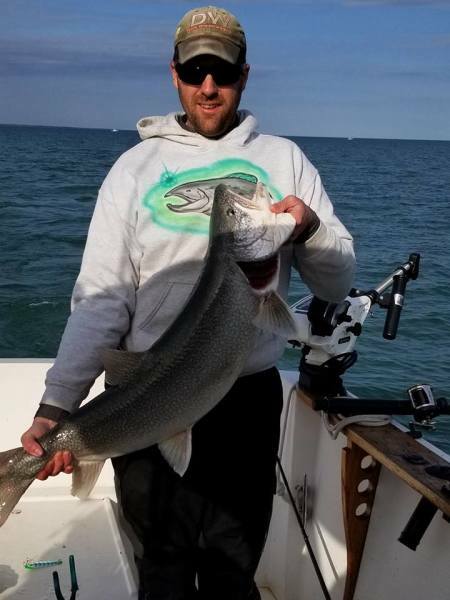 First weekend in May produced a huge Laker! Too bad Loc Derby wasn't on-going cause this fish probably would've been in the money. 27 lbs, caught out of Wilson harbor. I know everyone wants nice weather, but the fishing is great right now. Don't wait for late Summer, book now for constant action. Winning tournaments since 2010, check out the About section for more information. You don't need any experience to go on a Charter, Captain Joe drives the boat, sets the rods and nets the big ones! You just fight the fish. 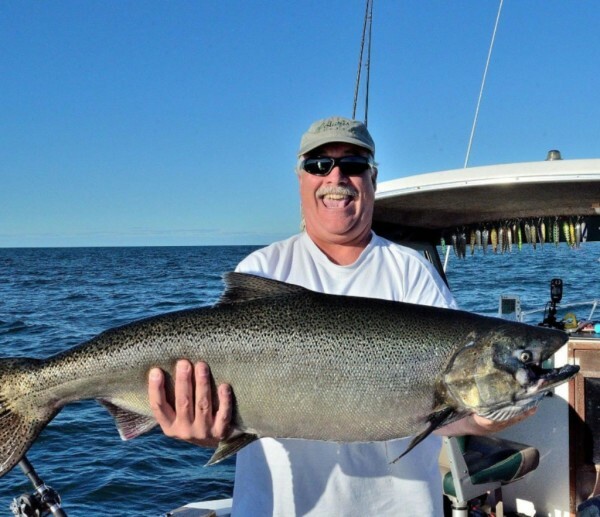 Captain Joe has experience catching various species of Salmon & Trout in Lake Ontario as well as fly fishing in different locations from New York to Alaksa. 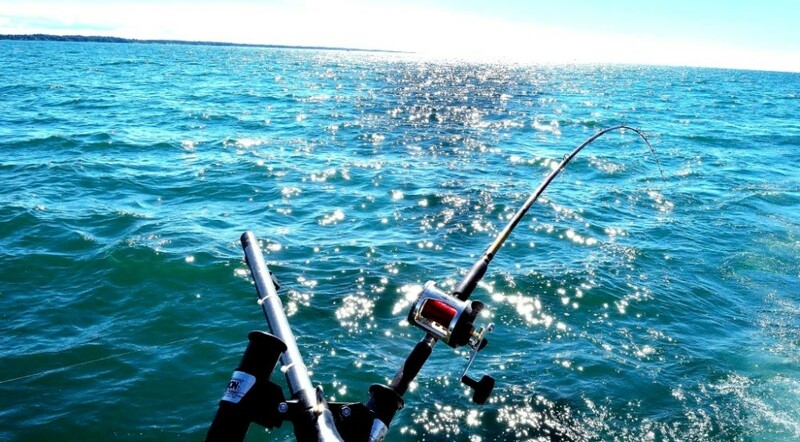 Contact us now to book your next Lake Ontario Fishing Charter today!